INTRODUCTION: Incisional hernias have a reported incidence of 15% following abdominal surgery. 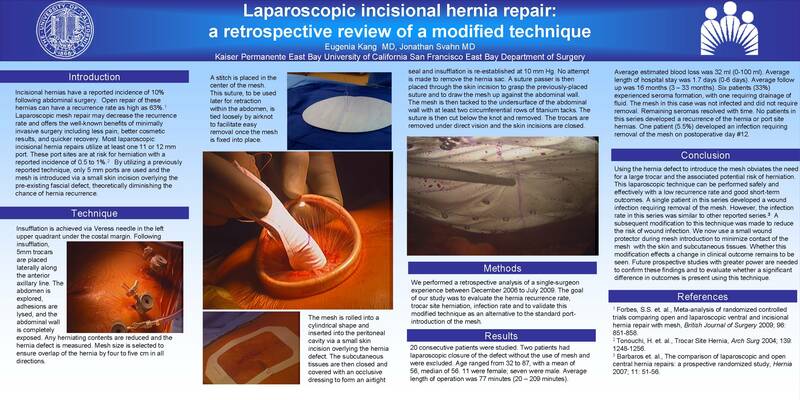 Open repair of these hernias can have a recurrence rate as high as 50%. Laparoscopic mesh repair may decrease the recurrence rate and offers the well-known benefits of minimally invasive surgery- chiefly less pain, better cosmetic results, and quicker recovery. Most laparoscopic incisional hernia repairs utilize at least one 11 or 12mm port. These port sites are at risk for herniation with a reported incidence of 0.5 to 1%. By utilizing a previously reported technique, only 5 mm ports are used and the mesh is introduced via a small skin incision overlying the pre-existing hernia defect, thus theoretically diminishing the chance of hernia recurrence. Insufflation is achieved via Veress needle in the left upper quadrant under the left costal margin. Following insufflation, 5mm trocars are placed laterally along the anterior axillary line. The abdomen is explored, adhesions are lysed, and the abdominal wall is completely exposed. Any herniating contents are reduced and the hernia defect is measured. Mesh size is selected to ensure overlap of the hernia by four to five cm in all directions. A stitch is placed in the center of the mesh, which is rolled into a cylindrical shape and inserted into the peritoneal cavity via a small skin incision overlying the hernia defect. The incision is then closed to form an airtight seal and insufflation is re-established. A suture passer is then placed through the skin incision to grasp the previously placed suture and draw the mesh up against the abdominal wall. The mesh is then tacked to the undersurface of the abdominal wall with circumferential rows of titanium tacks. No attempt is made to remove the hernia sac. METHODS: We performed a retrospective analysis of a single-surgeon experience between December 2006 to July 2009. The goal of our study was to evaluate the hernia recurrence rate, infection rate and to validate this modified technique as an alternative to the standard port-introduction of the mesh. RESULTS: 20 consecutive patients were studied. Two patients had laparoscopic closure of the defect without the use of mesh and were excluded. Age ranged from 32 to 56, with a mean of 56, median of 56. 11 were female; seven were male. Average length of operation was 77 minutes (20 – 209 minutes). Average estimated blood loss was 32 ml (0-100 ml). Average length of hospital stay was 1.7 days (0-6 days). Average follow up was 16 months (3 – 33 months). Six patients experienced seroma formation, with one requiring drainage of fluid. The mesh in this case was not infected and did not require removal. Remaining seromas resolved with time. No patients in this series developed a recurrence of the hernia, or port site hernias. One patient had an infection requiring removal of the mesh. CONCLUSIONS: Using the hernia defect to introduce the mesh obviates the need for a large trocar and the associated potential for herniation. The infection rate of is 5.5%, similar to other reported series.